What exactly is an eSports betting bonus code? A bonus code is a certain combination of letters and numbers that will trigger a specific bonus when entered correctly on an eSports betting site. 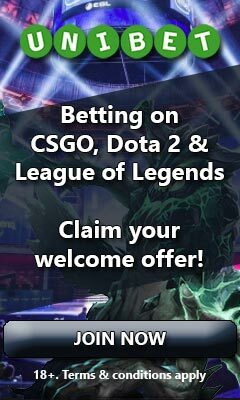 In the case of the above listed eSports betting bonus codes, the bonus will be one that can be used for eSports. It can be anything from free money to a risk free bet or a matched bonus amount on your deposit. Usually bonus codes are created by operators to give sites like ours here at eBetFinder.com exclusive offers. These tend to be more valuable than their regular bonuses and are therefore highly recommended taking part of. Not all eSports betting bonus codes are like this though. Sometimes operators decide to use codes on their own offers, which are those available for anyone who visits their sites. There are various reasons for them to do this with one being an easy way to separate bonuses from each other. A bookie may for instance offer two different welcome offers where you have to choose between them by simply entering the code that is linked to the bonus you’re interested in. This can vary from one site to another, but it should never be very hard to figure out. Most of the time you’re supposed to enter the code in a field which you will find during the deposit process. This will then trigger the bonus on that particular deposit. Sometimes it may, however, be that the code needs to be entered on a field which you’ll find under your account settings. In rare occasions codes linked to sign up offers could also require you to input the code during the actual account creating process.